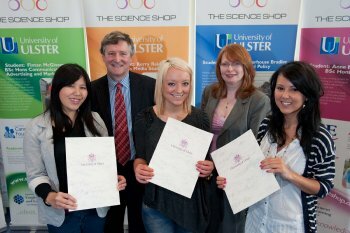 University of Ulster students who engaged in a unique Science Shop project have been recognised for their achievment at a special ceremony at the Coleraine campus. The Ulster Science Shop is an innovative community outreach initiative which pairs skilled students with community groups in need of specific knowledge and expertise. A team of second year Hospitality and Tourism Management students undertook a Science Shop challenge to help plan and manage a conference in partnership with the Coleraine and District Samaritans. The students undertook the challenge as part of a Meetings, Incentives, Conventions and Exhibitions module they are studying as part of their degree course.